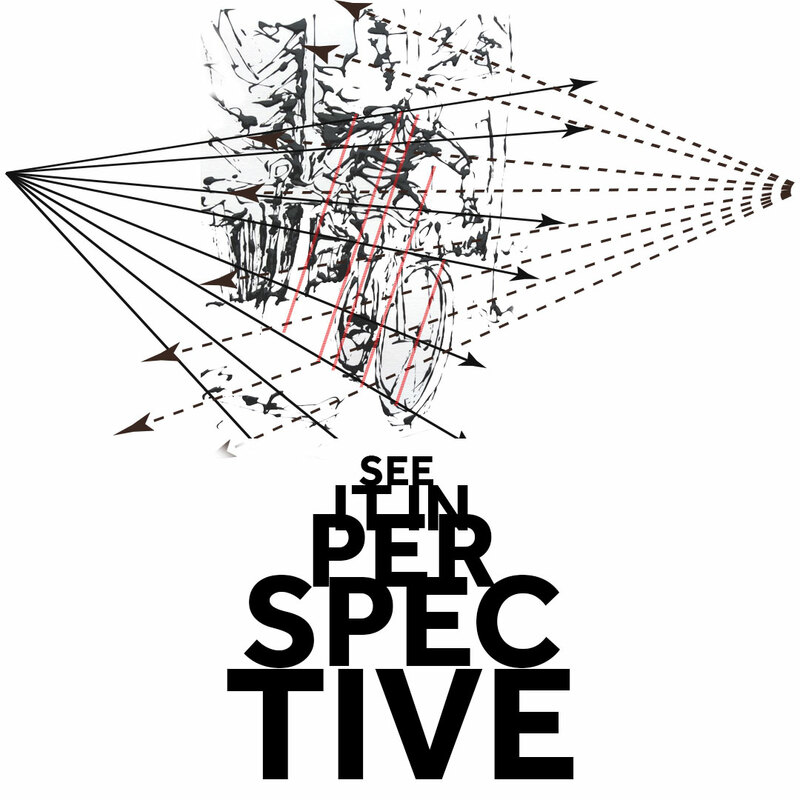 Perspective is about how we see things in space. It can be difficult to understand at first. However, having the ability to see in perspective is the key to capture something intangible such as the space around us, and enclose this 3D form in a flat, white piece of paper! Done it right, it can show us the world from an angle beyond ordinary human observation. One point, two point, three, four points of perspective! – How many points of perspective can we have? What a variety of unusual angles we can project by connecting just the dots…! I needed to find the best point of perspective, which in this case would unable the rider to ‘visually’ jump out of the picture. What would be the best solution? 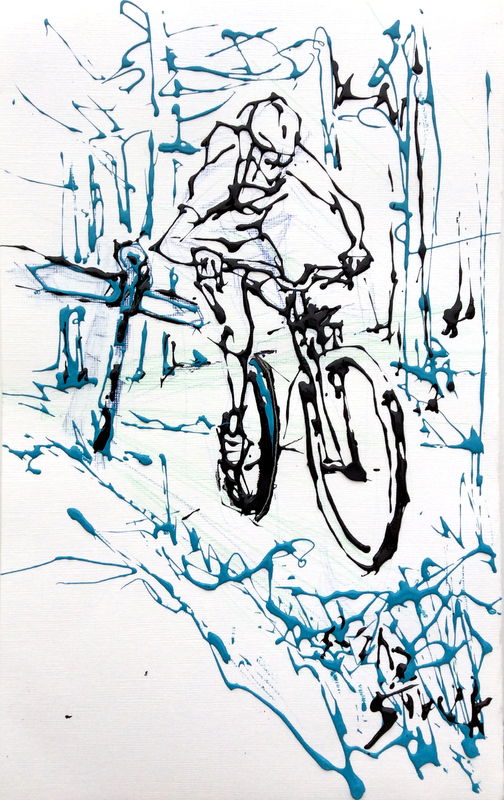 Bike drawn over two point perspective grid. I have used two point perspective: Two point perspective uses two vanishing points placed on the horizon line. Receding lines are drawn from each one of the vanishing points. 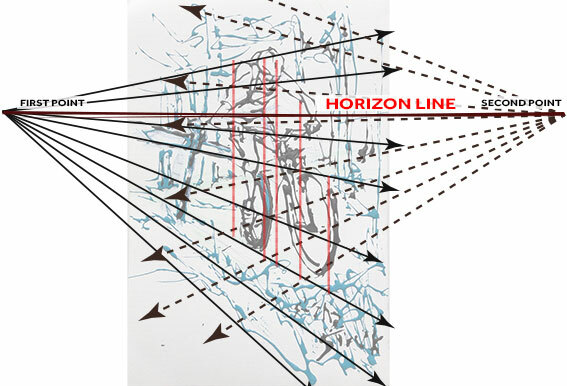 The eye of the viewer will follow along these lines to one of the vanishing points. Parallel, vertical lines are drawn to indicate where the biker ends and his height. The closer that these lines are placed in space to the vanishing points on either side, the longer the form appears. Once we know how to place an object on the perspective grid, we can play with a variety of arrangements of vanishing points and angles. I have to admit that when I am painting I can see the objects I paint perfectly arranged on a grid which I mentally draw in my head; and see those objects on the paper before they are being even drawn. 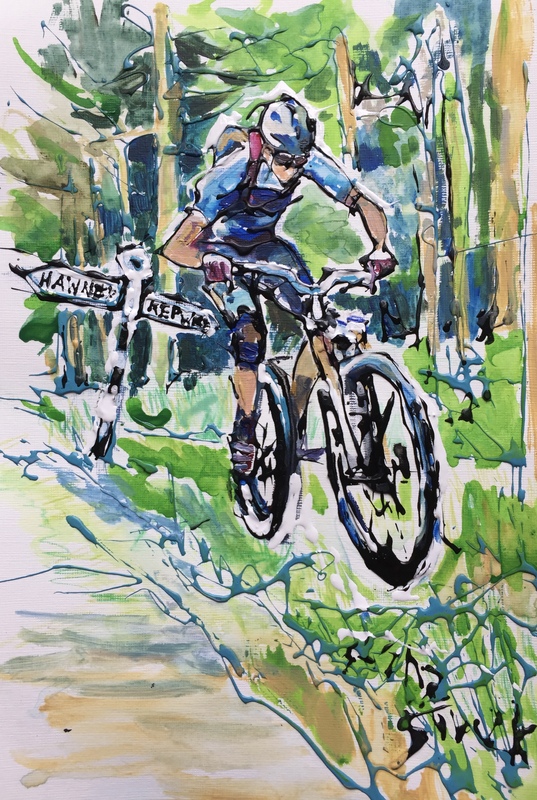 Commission me to create for you a personalised piece that captures you or someone you love in a favourite sporting activity. – anywhere you want – you can have any landmark in the background to show off your most memorable adventures and achievements. If you have any photos, one is all I need, however, even if you haven’t got a photo, description works fine. Try to order two weeks before the birthday or anniversary. Prices start from £90 but contact me so we can discuss your best option. The moral of this story is: WE GIRLS DON’T NEED TO KNOW HOW TO CHANGE THE TYRE, because the cyclists men are real gentlemen and would always help on the road. 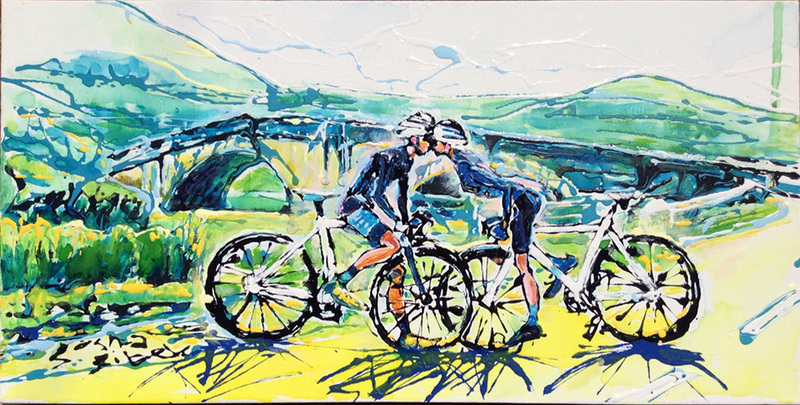 The kissing cyclists – the original is still available from my Etsy shop. 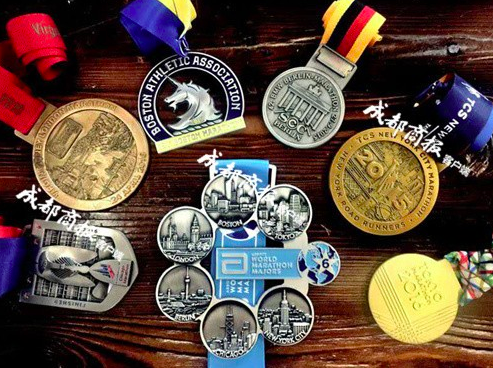 Who is a World Marathon Majors Six Star Finisher? 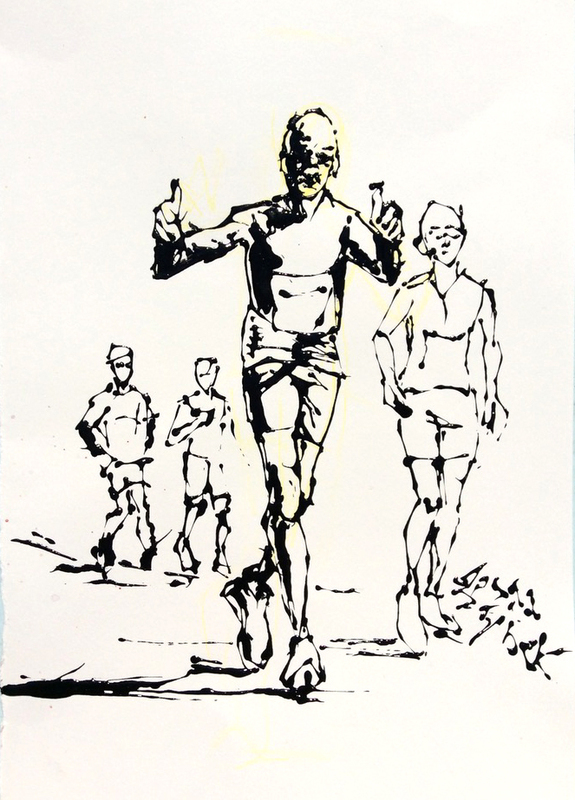 Those are runners who successfully complete all six of the marathon races: in Tokyo, Boston, London, Berlin, Chicago and New York City. Wow! 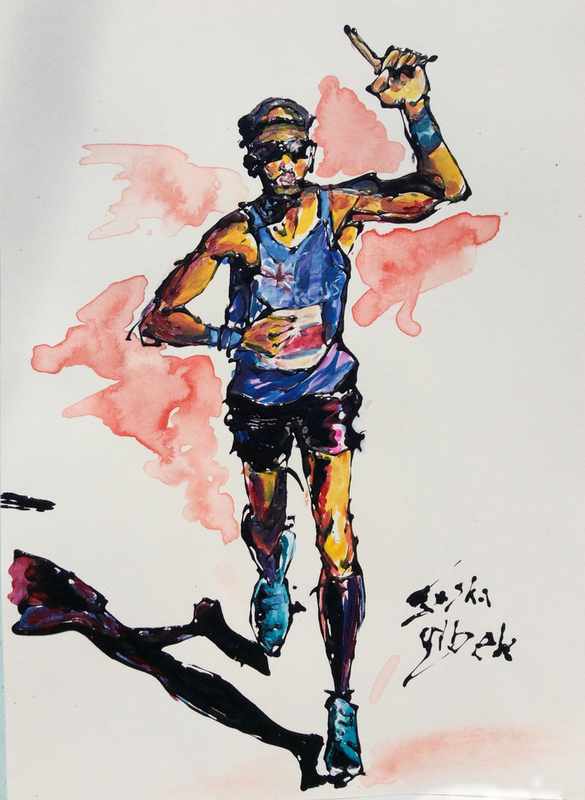 To run a marathon is a pretty amazing achievement. To run six of them – that’s a challenge only a few can undertake. What does it take to become such a person? 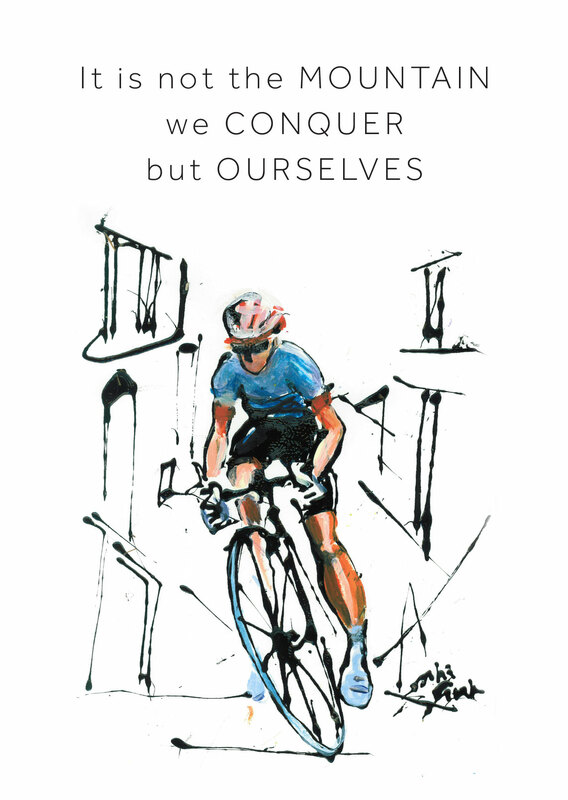 Do you need to be self-disciplined, determined, focused? Marcus, who is the focus of my latest commission, talks a lot about achieving your goals and better yourself. I am really working on it: to become the best version of Gosha I can be… But life throws at us many obstacles and temptations which we need to fight with every day. Not everyone has enough will power and energy to fight. Sometimes the paint splashes accidentally, not all the lines are perfect, however, that imperfection and accidents create great sense of movement. This is the reason why I have never finished the picture. 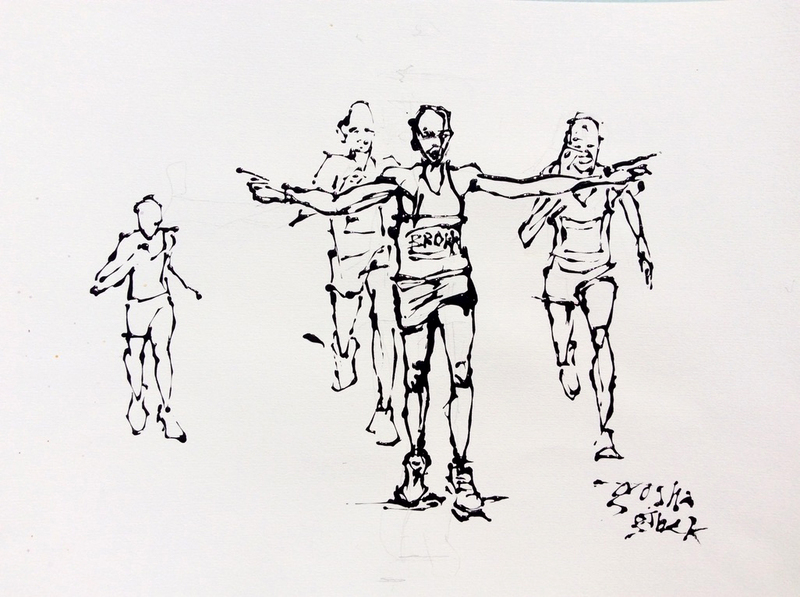 Maybe if I did add colours the runners would have come to life. Finally, Marcus running Tokyo Marathon. With other participants behind, the picture becomes rather lively and has a potential to become interesting. 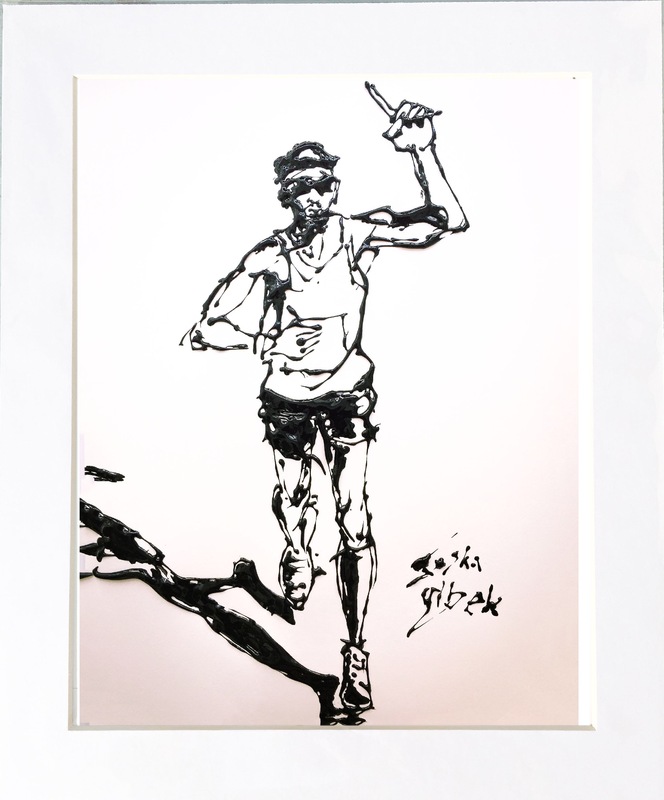 Even though there’s too much paint on the runner’s face, it could be easily fixed by overpainting with acrylic paints which I am using to finish the artwork. I may not be running a marathon but my goal is to create art for all of you amazing people. 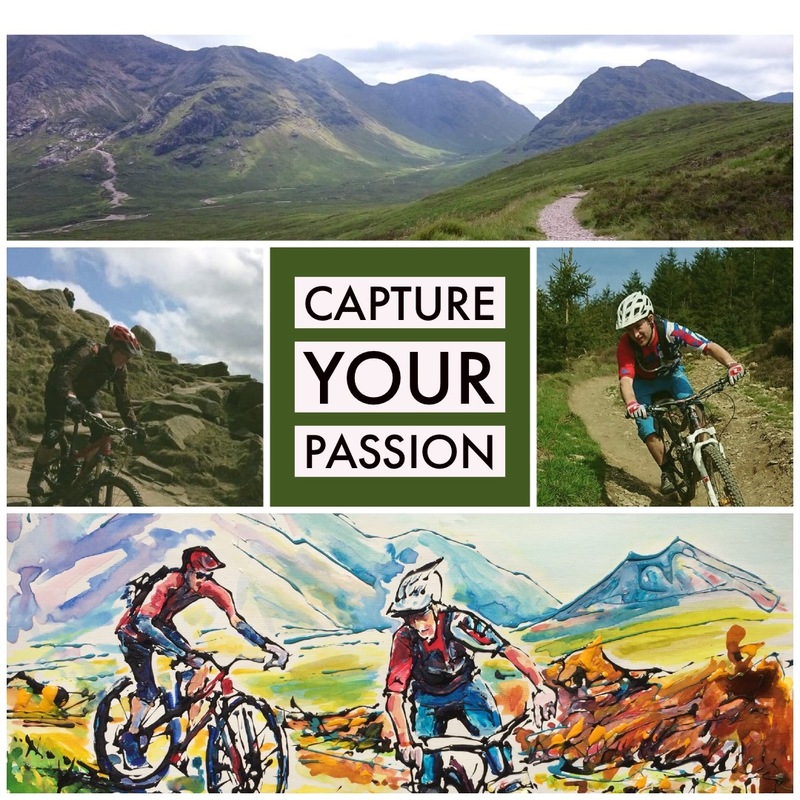 To capture your achievements and keep the world inspired. So, I am looking for you but you can find me first! Get in touch if you’d like me to create a portrait similar to the one I’ve done for Marcus. Into the forest, I go, to lose my mind and find my soul. I know how it is like: January, days look grim, it is cold, dark and rain is pouring down the sky. On the days like this, we miss the sunshine, the warmth and the fresh breeze of air: those prompts which easily motivate us to go outside and enjoy life. Like many others on New Year’s Eve, I longed to start something new. I wanted to capture the essence of new beginnings, one that comes with the new year and the beginning of spring, the feeling of fresh, warm air blowing for the first time after months of bitter cold. 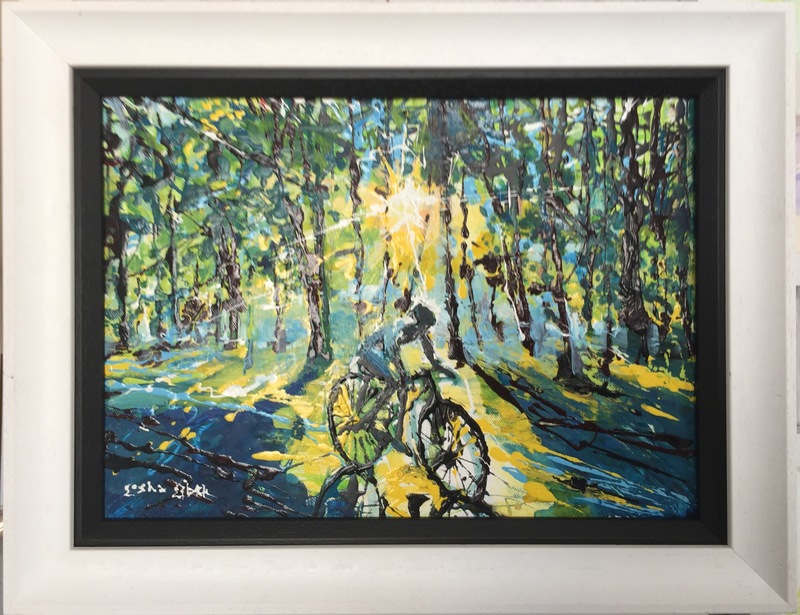 This piece is called “The First Rays of Sunshine.” and it has been created to bring you closer to spring, fast-forward those juvenile days we are longing for on cold January days. It’s the early morning. The air is cool and smells of fresh pine, while the sun shines, warming your skin. Riding slowly through the woods, you hear the “tweet, tweet, tweeeet” of the birds above you. You take a deep breath of crisp air, looking at the clear, blue sky. 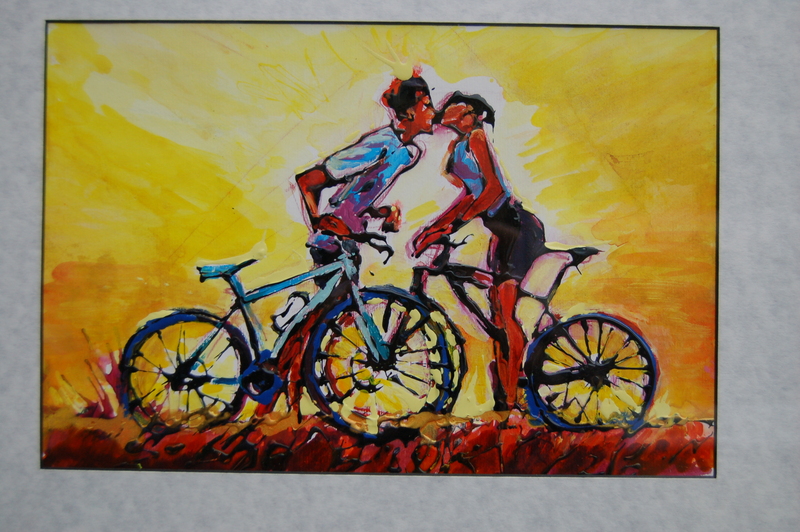 Here, I’ve used my signature medium – a mixture of gloss paints for the subjects and oil paints for the background. Oil paints can often be difficult to use, as they tend to dry very slowly, but the patience is promptly rewarded with a lovely texture I frequently incorporate into my artworks, such as this one. I usually reproduce my imagery on a card. I feel that doing so I am giving you the best opportunity to enjoy my art and wider spread my desire to inspire and motivate you to go outside and enjoy life. Now, you can download a FREE PDF of this card. The file is all set up to print on a card or to use as a screensaver on your device. and further 4 x A5 cards. The draw closes on 31st February 2018, the winners will be announced on 2nd February. 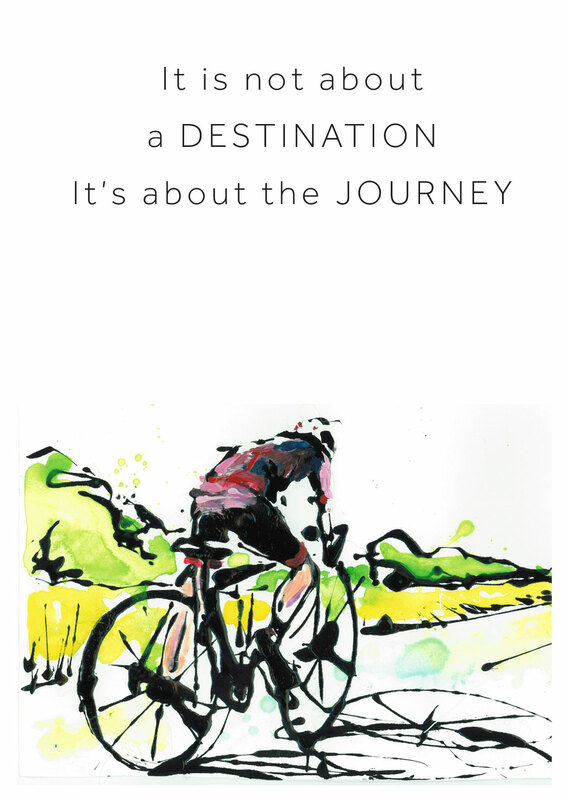 I was always very envious seeing people on bikes and wanted to join this great activity. After buying my first road bike I have joined the local Clitheroe Bike Club. It was the start a great period in my life, full of adventures, challenges and a connection with great people. Every Saturday the club meets at 9am to go for a ride. Split into groups, varied according to our abilities and skills, I found my love in climbing hills: The hilly billies was the name of my group as we were deliberately choosing difficult routes, full of challenging uphills. A Christmas party took place in my Cycling club and it impressed me to prepare some gifts for the raffle. That was the first time when I used my special technique and made a few cards. I had lots of fun creating and the feedback was so positive… I got loads of orders, people wanted my pictures and cards for presents! Few years after and I have created an elaborate collection. I would like to tell you something about my technique. It is particular. I simply use an ordinary non-drip gloss paint which I pour freely from a pallet knife. The tool never touches the paper to allow the image to have its own life. The effect is great – even when the paint is dry it looks glossy, it keeps shining, and because I never sketch what I am painting as I totally rely on accidental splashes in order to capture the movement. When the paint is dry I can cover certain slip-ups with an acrylic paint and add a little wash of ink in the background. With a splash of the colour, the picture takes a different life. 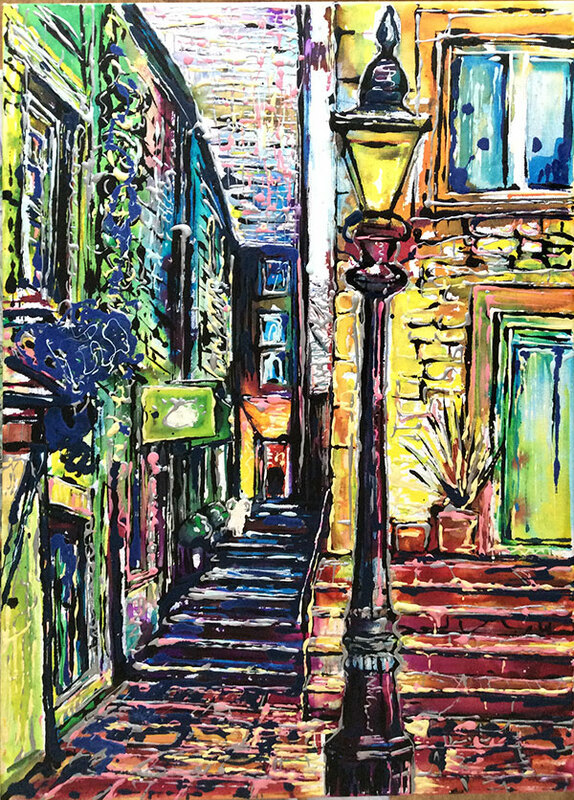 I encountered an artist in one of the London Galleries, Paul Kenton – he was using something similar to create his cityscape. I thought I would like to try this technique, however, struggled with finding appropriate paint. Acrylics were too runny or too thick, I wanted nice, gluey consistency. I think that’s how I thought about the gloss paint – having found a tin at home. My technique developed a lot since the first time I had used it and you can view available originals, prints and cards in my SHOP area. This is my new picture which I am currently working on. I managed to record its beginnings. 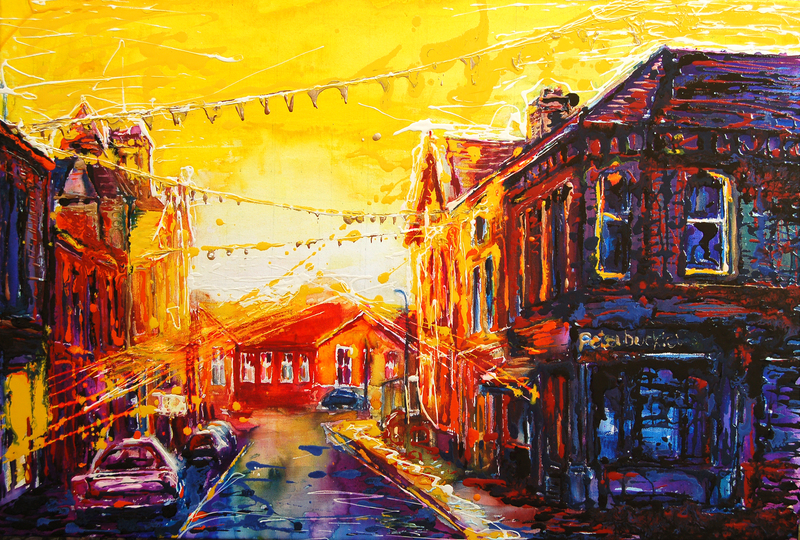 In this short video see how my town is emerging from nothingness of the canvas. Through lines and shapes, strokes of a brush, splashes of ink; I am forming, creating and bringing to life a town, my town, formed from a white cloud and confusion of my thoughts and ideas. I really felt like GOD, having total control over this scene, left purely to my imagination. It is so empowering and scary – I can do anything with this picture and my intentions are good – I want the summer, the sunshine, energy and buzz. But it is easy to turn the image into a gloomy, terrible world, and then these buildings, bushes, trees and people will be locked forever in the hell of my mistake. STAGE 1: Oil painting, establishing colour scheme. 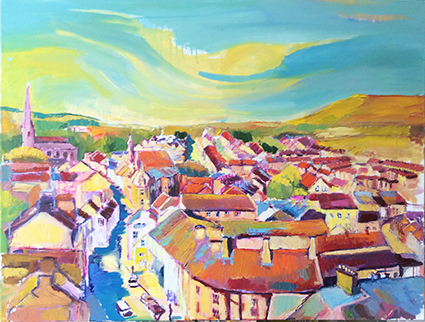 Clitheroe – oil painting, establishing colours. I’ve spent hours painstakingly mixing paints, trying to find the right colour. 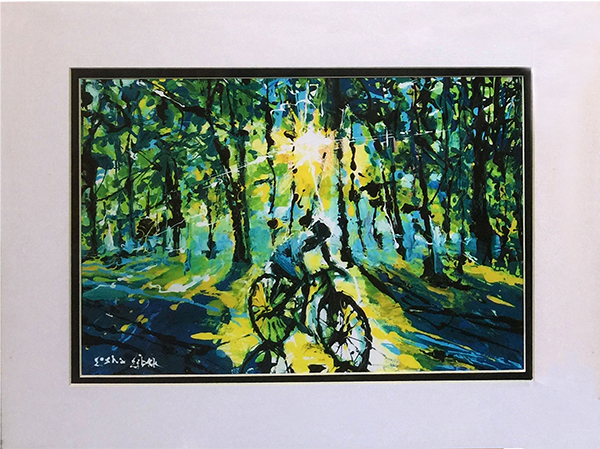 My aim was to leave an impression of summer afternoon with its strong sun lights and contrasting shadows. The colour was really important but I couldn’t decide on a colour scheme. Because I wanted the feeling of summer with plenty of sunshine, going into a yellow–pink scheme felt like the most suitable direction. But the nuances are so difficult – too much yellow, makes it too fresh for a summer, adding too much orange will make it look tired and dark! I used vibrantly deep Ultramarine Blue for the shadows which colour, derived from purple seemed the most appropriate. However, red and orange hues would give a feeling of an evening. I also thought about green but I don’t really like green after all, not in its pure form as such colour would remind me of a Spring. Yet, I wanted to show summer with its hot, bright colours based on yellow and ochre, pink and peach. Now it’s finally time for fun! : enamel. This is the time when my hand goes free, it has a chance to improvise and relax. This is a time of FREEDOM. This is also a time to make quick decisions when the enamel runs down from my palette knife. I have settled to leave the surface of the buildings in a pink, peach kind of colour. I have then added bright, light blue and pink lines, highlighting the tops of the roofs and edges of walls. Blue and pink are contrasting, nearly complementing themselves so the combination should create a contrast I desire. However, those bright lines weren’t that visible, they blended with the light colour of the buildings. I’ve added medium blue (Cerulean) and it started showing some visible changes. Adding yellow only on the buildings’ side and white on the top of the roofs would show highlights on those shapes. The navy blue is going to go in the shadowy places, tracing the outlines of buildings and windows. Not too much, it could be easy overworked! The enamel work was fun! But I needed to be quick, the paint is running off my tool uncontrollably. 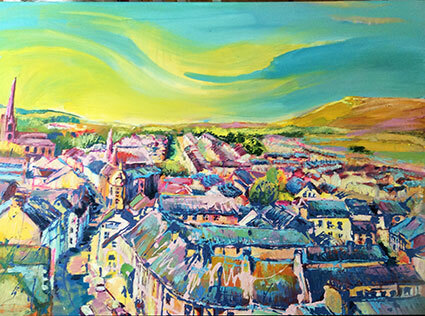 This painting is being painted for an open exhibition at Stewards Gallery in Clitheroe Castle, titled ‘Town v Country’. It’s nearly finished. 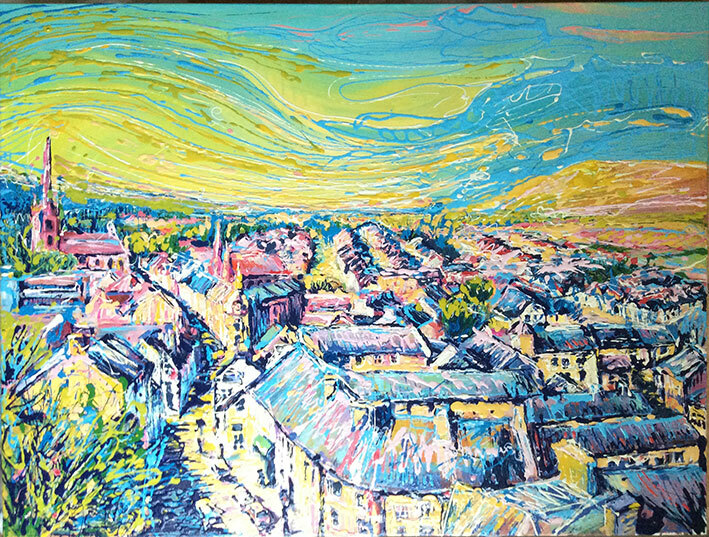 I am going to wait for it all to dry and using some dry brush technique – layer of rubbed paint on the top of existing image – I want to leave the town in the sunny mist. What do you think? I would really appreciate and welcome your constructive feedback. Please subscribe to my blog to learn about my art techniques and colour. Details of the exhibition to follow. What do we like about landscape painting? Living in a beautiful countryside is a source of inspiration to many artist and many indeed find joy and passion in recreating the scenery on their canvas. There is so much enjoyment out there, in constantly changing light affecting the clouds and the sky, the texture of grass, the pattern of fields which spread before the eyes like a patchwork, the lines of dry stone walls, the reflection in water, shadows of trees and bushes as they move gently in the air. Despite all that stimulus, I find that approaching a blank canvas and simply beginning sketching the fields, the hill, the dry stone wall, creates a problem, the image on the canvas does not appear that exciting as it excited me out there. I want to know what it takes to create a stunning piece, grabbing hearts of people. I want to be the one who shows the world from an angle beyond an ordinary human perception, surprises. I’ve done a little survey asking my viewers to give their suggestions and here I’m presenting my results. Which style attracts you most? Traditional – realistic style, a bit figurative. 3. Colourful – The one where colours are abstract, unreal like in Fauvism. 4. Naïve style – where objects are depicted in simple forms. 5. Abstract landscape – objects are losing their forms, it’s a composition (a set up) of colours and shapes, nothing appear to look real. So you are intrigued Maureen, that’s a fantastic answer. I also know that you see seaside – which is a place you want to be. Person 3: [the abstract painting which is number 3, is] the most unique and expressive and colourful. Person 4: I’d probably go for 1and 3 out of this selection because I like bold strong art but with content. Person 5: I like no 1 best though very much appreciate the modernistic view of no 3. Person 6: Its 1 and 2 for me because I find peace when walking in fields. Person 7: Number 4 and 3. Simplicity, and brightness. At least for once the naïve style gets the votes. Person 9: Number 1 and number 5. Just love the poppies. The pictures draw you in to make you want to be there. Many discover a familiar place, some place from their memories or dreams. Place they have been to, which they recognize, or a place where they would like to be, place where they would feel comfortable and happy. Such place they see is intriguing, inviting, alluring… and such place is real, easily recognizable. There might be some elements in this landscape art, that they like the most, such as poppies or simple the sea side J. Some of you appreciate and notice the artist’s unique expression, a technical innovation such as: interesting brush strokes, bold colours, texture. Those are affecting the mood and the mood of the painted landscape is also important, frozen from ever so changing weather condition. The weather on the painting affects our mood and the overall mood of the painting. 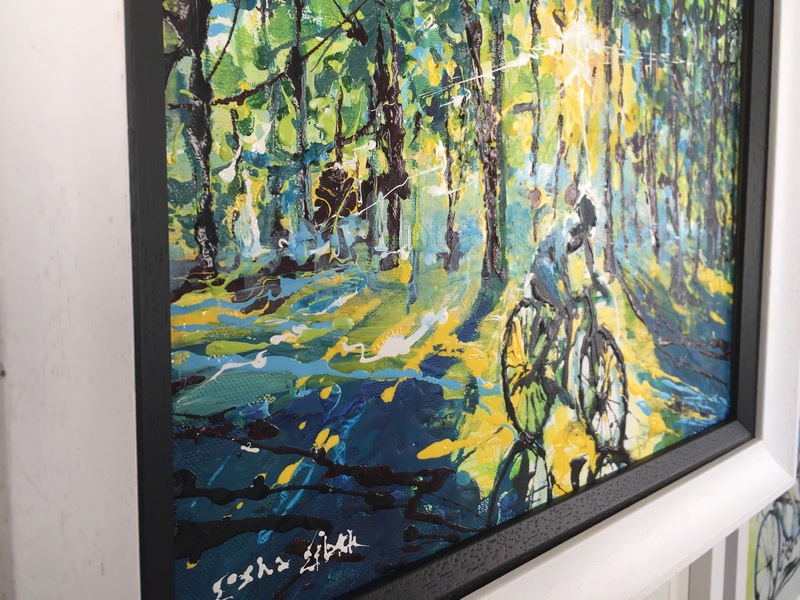 Whatever you like about the painting what’s most important is to feel the connection with the image on emotional or spiritual level. It is that feeling of nostalgia which the painting evokes, that makes people like it and want it.. So: memory of place, place you want to be, interesting technique, and the feeling of connection – these elements all together are ingredients for a perfect masterpiece. Thank you for your survey. Starry Night by Van Gogh. He painted it towards the end of his life, the mood expresses sadness and loneliness. One of my favourite landscape artists is Vincent Van Gogh. He was certainly a master of colour and mood. Notice how his countryside paintings are rich in a variety of yellows and how they shine like gold when juxtaposition with dark blue or green. His thick layers of paint, with brush strokes so expressive, seem to be dancing, creating a sense of movement. By highlighting elements such as stars – they appear to have a powerful influence, or birds in his famous painting ‘Wheatfield with Crows’ , he brings anxiety and gloom. I have seen the masterpieces of Van Gogh in Van Gogh Museum in Amsterdam and it was an experience comparable to seeing your favourite band live, so emotional and enriching. All the ingredients mentioned by you are contained in those paintings: reality yet in an unusual way. The golden wheat fields remind me about Poland, hot Polish summer which I really miss. What would I like to achieve as a landscape painter? I have asked the question to meet your needs – you as a viewer, receiver of my imaginary and hopefully a collector… I have to admit, I do not seek realism as this job is reserved for cameras. Painting a landscape is ever such a challenging task as the scenery I see and get excited about is unreachable, so fleeting, at that moment at that time when I look, it looks different and I know it won’t last, time changes the image at every moment of the day and night. My desire is to stop it, frame in my memories. I would appreciate to know your thoughts. Each of this images can be bought as limited edition A5 card for the price of £3.50 – postage included. Just send me your address. 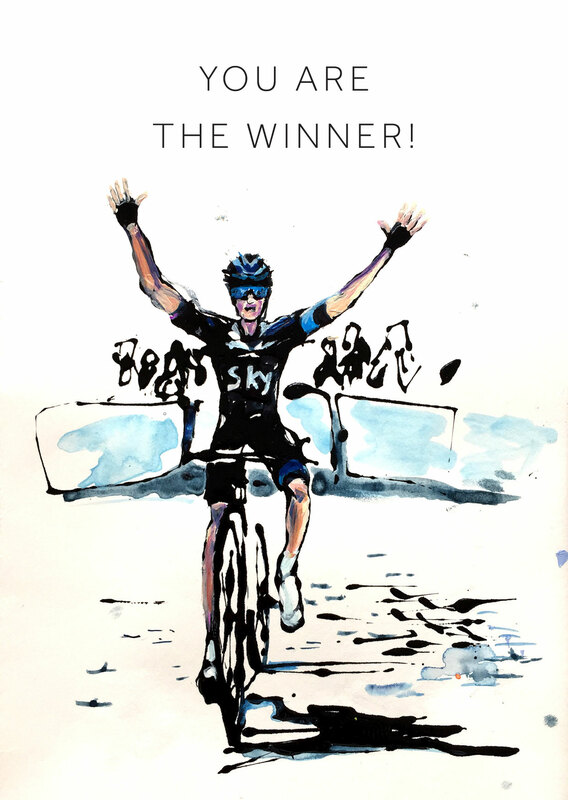 I have also a very fine quality art giclee prints at the price of £10 for A4 or £20 for A3. ArthurSchopenhauer, 19th Century German philosopher, held that human wild and powerful drive to survive and reproduce is essentially what causes suffering and pain in the world, and that the only way to escape the suffering was through art. People should either create or contemplate art. I wanna… get the f*** out of here…over to the moon. Original Screen printing, 45/60cm, £40 unframed. Art is truly a therapy. It is about the idea of self-exploration that can often lead a person to some insightful conclusions about themselves. By expressing yourself through art, you see things about yourself that you otherwise may not have comprehended or not have been able to articulate. While creating art we become more objective, confident, the whole life and reality attached to it goes into perspective. It feels like being in a different dimension, world where you’ve got the power to influence and set your own terms. Dictionary states: creation is an act which causes something to exist. Imagine, how amazing it must be to possess such power, power of creation! To be free from routine and from inevitable, free from hard work and from ‘I have to’ – BELIEVE ME, it is a powerful feeling. Can you even imagine what would it mean to possess such great power? Having such power means to be able to influence people, to have the capacity to bring about change. For me having such power, the power of creation, means to be able to BE, without other forces interfering. It means to be loyal to myself, to have freedom to release myself from that other self – the torn and forked one, the weary, the loaded one, the enslaved…Power of art makes me agree with myself, cease the inner dispute, it means to be FREE. Power of ART MAKES ME COMPLETE. Would you like to experience such feelings? COME TO MY PAINTING WORKSHOP AND EXPERIENCE THE FREEDOM. In the cosines of my studio – homely atmosphere of my house. Friday or Monday mornings, with coffee, tea, biscuit and sandwich. Only £30 for 3-4 hour session, £110 for four weeks, materials and lunch provided. Email me to discuss your preferences of time and requirements. If you like my art and would like to see it in flesh, contact me and arrange a visit. Subscribe to my blog and be first to receive free gift – printable picture by me.